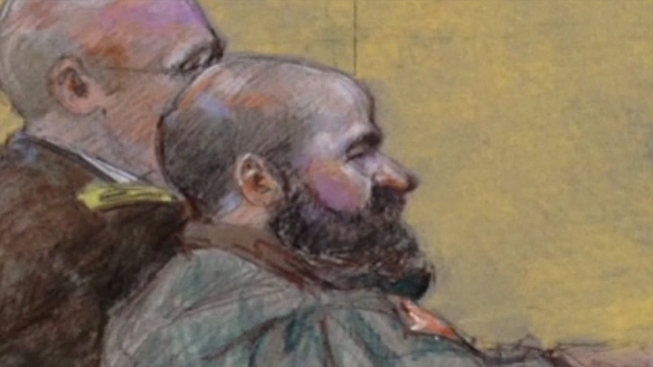 Maj. Nidal Hasan rested and said nothing during the sentencing phase of the Fort Hood shooting trial Tuesday. Sentencing will begin at 9 a.m. Central time Wednesday. That's when the jury will be given instructions and closing arguments will be made. The prosecution rested on the second day of testimony, then the jury went to lunch, with Hasan set to present his defense starting at 2 p.m. Central time. He could have made a sworn statement subject to cross examination, an unsworn statement with no cross, or both. Instead he chose to rest without saying anything to the jury. Hasan was convicted Friday of killing 13 people and wounding dozens more. Now, the jury is deciding whether he will receive the death penalty or life in prison. Hasan originally said he'd like at least half a day to prepare a sentencing-phase defense. But he said Tuesday more time wasn't necessary. He mounted virtually no defense during his trial and is not expected to call any witnesses or present any documents in his defense. Prosecutors presented testimony on the effect of the crime Monday and Tuesday, while asking the panel of 13 high ranking military officers to impose a death sentence. Jurors will have to come to a unanimous verdict in order for Hasan to be put to death. Family members described the terrible hours before learning what happened to their loved ones after learning about the November 2009 shooting. Teena Nemelka, stepmother of murdered Pfc Aaron Nemelka said two soldiers came knocking on her door around 11:30 p.m. that night. “You just freeze, you don’t want to open that door. You don’t want to hear that news that you lost your son,” she said. Jerri Krueger said her daughter, Sergeant Amy Krueger, joined the Army after September 11, 2001. “When a parent loses a child it’s something permanent,” she said. “There’s apart of you missing. I live with that every day.” Krueger said. Retired Lt.Col. Randy Royer was shot twice that day and still walks with a cane because of his wounds. He received a medical discharge from the Army after the injuries he suffered in the shooting at a crowded medical processing building. Royer said he also has anxiety problems, especially when visiting the local pharmacy. “They have all the chairs lined up. I don’t do well,” Royer said.